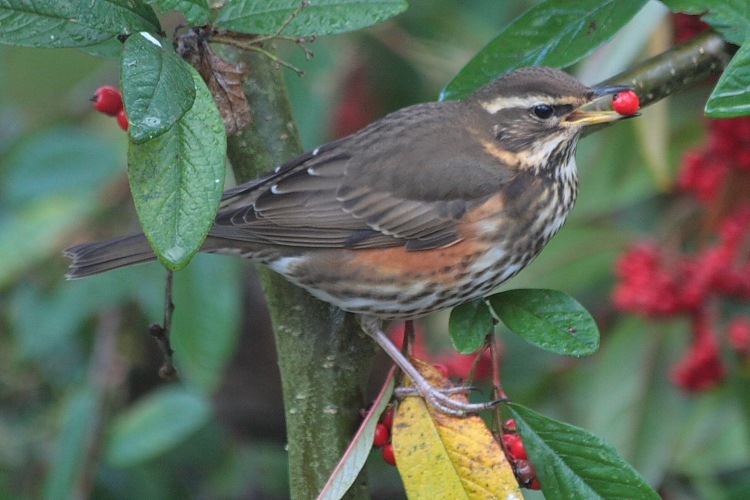 Our Redwings have been back, foraging in the bush laden with red berries at the rear of our property. It’s curious how slightly different markings on a less familiar species make it more interesting to observe, giving it more than just a casual glance. I was spending 30 minutes or so yesterday watching a few Redwings again, this time with my camera in hand, waiting for any reasonable opportunity for a portrait to arise when I thought one Redwing had positioned itself about as close to me as possible. As soon as I whipped the camera up to my eye, though, I realized my mistake – a song thrush had joined in foraging for red berries. Since the most prominent feature on both birds is their speckled chest, they really do appear quite similar at first glance. 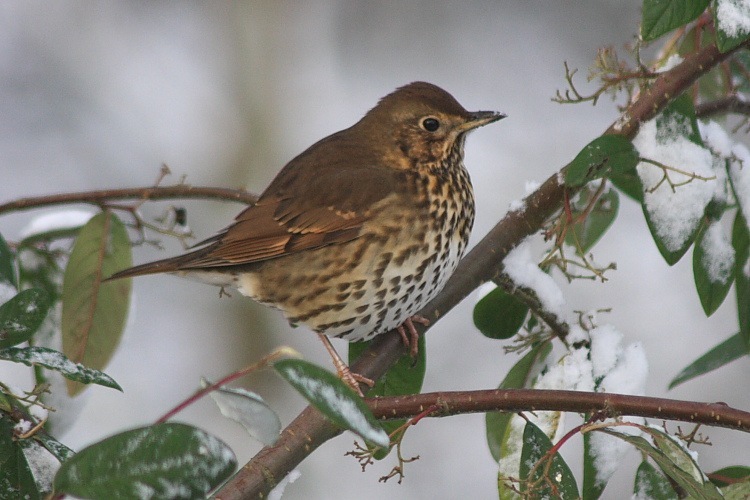 Seen side by side, they are really somewhat different – grey versus brown with the Song Thrush lacking the russet arm pits and striking eye stripe of the Redwing. After a little while a couple of hen Blackbirds turned up. Once seen together, I noticed that they are considerably larger than the Redwings. They proceeded to harry the poor ol’ Redwings and chase them out of the bush full of red berries. 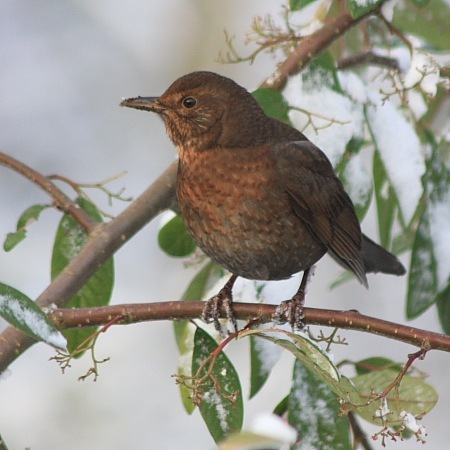 It was as if the Blackbirds, being resident, had been watching the berries developing over the seasons and now they didn’t want to lose their valuable winter food source to these blasted immigrant cousins from Scandinavia. The Blackbird, whilst being probably our finest songster and demanding of aural attention, is so common that it tends not to solicit particular visual attention, definitely falling into the give-it-just-a-casual-glance category. This time, though, Just because I could, I snapped a picture of one of the hen Blackbirds, and noticed, for the first time, that their chests are also quite speckled in a subdued sort of way. I knew all these players are members of the thrush family, rather unflatteringly named turdidae, so the family resemblance wasn’t a surprise but it stressed how easy it is to pay too little attention to the locals.